Private equity firmsTop 10 Private Equity FirmsWho are the top 10 private equity firms in the world? Our list of the top ten largest PE firms, sorted by total capital raised. Common strategies within P.E. include leveraged buyouts (LBO), venture capital, growth capital, distressed investments and mezzanine capital. are investment management companies that acquire private businesses by pooling capital provided from high net worth individuals (HNWI) and institutional investors. Private equity jobs are some of the most sought-after and competitive careers in finance. Altogether, private equity firms manage nearly $1 trillion of investment capital, which they put to use through strategies such as direct investment in private companies, leveraged buyoutsLeveraged Buyout (LBO)A leveraged buyout (LBO) is a transaction where a business is acquired using debt as the main source of consideration. An LBO transaction typically occur when a private equity (PE) firm borrows as much as they can from a variety of lenders (up to 70-80% of the purchase price) to achieve an internal rate return IRR >20% (LBOs), and sometimes even partial stake purchases in public companies. Large, noteworthy private equity firms include The Carlyle Group, Bain Capital, and Kohlberg Kravis Roberts (KKR). There are many smaller, “boutique” private equity firms that handle smaller dollar amount deals and are usually highly specialized as to the types of companies they invest in. It obtains a controlling or sizeable minority equity interest in the company receiving funds, sufficient to effectively provide the private equity firm with managerial control of the company. It then utilizes that control to hopefully direct the company’s growth along a path that maximizes returns on the private equity firm’s investment. It also receives a periodic management fee from the company receiving financing (for example, an annual management fee equal to 2% of the total financing provided). For each capital fund that a private equity firm manages, it receives a share of yearly profits, and a substantial share of the profits (a typical percentage is 20%-25%) when any company the fund has invested in is sold privately or taken public through an initial public offering (IPO). The investment horizon – the time frame for a private equity investment paying off through a private or public sale of the company – is generally between four to seven years. This means that within that time frame, the private equity firm expects to be able to either profitably sell the company outright or relinquish its equity interest in return for part of the proceeds from an IPO of the company. Private equity firms raise a number of pools of capital. Each pool of capital becomes a separate fund that invests in companies selected by the fund manager. The money in the funds is used acquire an equity interest in a number of private companies. These may include startup companies and companies that were previously publicly traded but have since been delisted from the stock exchange, usually as a result of the stock failing to maintain a minimum price. Private equity funds appear in the form of either limited partnerships (LPs) or limited liability companies (LLCs) with a finite lifespan. The general/managing partners of a fund will typically spend up to two years raising funds, then invest in and manage companies for four to seven years, and have a plan to exit all of a fund’s investments within 10 years. Each separate fund managed by a private equity firm is usually dedicated to investing in certain types of companies. For example, one fund may focus on startup technology companies, while another fund may invest growth capital in existing healthcare or pharmaceutical companies. The total net profit for a private equity firm is the sum of the total profits from each of the funds it manages. Because private equity firms provide very large amounts of investment capital, there are usually very high minimum investment levels for those wishing to invest in a fund in return for a corresponding share of the fund’s profits. Minimum investments required may range from $250,000 to $1 million. That’s the reason that private equity investing is restricted to institutional investors and very wealthy individuals. 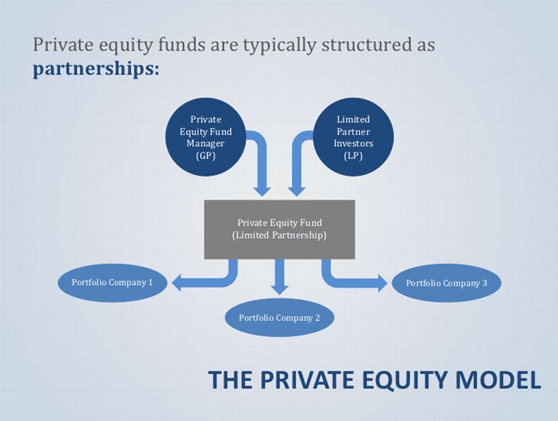 Minimum investment requirements vary from one private equity firm to the next, but may also vary among different funds managed by a single private equity firm. Private equity jobs manage to attract top talent in the financial services sector. There are a number of key positions to fill at a private equity firm, and virtually all of them require experts in one field or another to fill the positions. Private equity firms tend to be noticeably smaller, staff-wise, than investment banks, which translates to intense competition for a limited number of slots. Also like investment banks, private equity firms usually have a clear staff structure between junior and senior personnel. Basically, those occupying senior executive positions, such as individual fund managers, are responsible for making key investment decisions, while less experienced junior level personnel handle the less glamorous work of researching companies, writing reports, and preparing prospectuses. Because private equity firms expect to employ the cream of the crop, so to speak, they typically pay their employees top dollar salaries and generous performance bonuses. Private equity firms are among the highest-paying employers in the financial world. Associates are the most junior professionals working at private equity firms. Many of them enter private equity work after having gained a couple of years of experience working for an investment bank. Private equity firms rarely hire undergraduates directly out of college, preferring instead for even their lowest-level financial professionals to have at least minimum experience in working in the financial services sector. Associate work consists mainly of research, due diligence, financial modeling, and report writing. Like analysts and associates in an investment bank, if they aren’t experts at preparing spreadsheets in Excel when they arrive, they become experts soon after arriving. One task typically assigned to associates is reviewing and summarizing confidential information memorandums (CIMs), which are documents produced by investment banks that contain information about potential investment opportunities. Associates also assist senior personnel in tasks such as monitoring companies in the firm’s portfolio, sourcing deals, handling transactions, and fielding phone calls from investors. Associates commonly go through a two- to three-year program that includes a lot of on-the-job training. Private equity work is very specialized and little undergraduate or even graduate work serves as direct preparation for it. Most private equity firms structure an associate’s work to gradually teach them the business of private equity, gradually increasing their responsibilities within the firm as their knowledge and skill levels increase. Salaries for private equity associates vary widely among firms and usually include significant raises from one year to the next, but generally range from $115,000 to around $160,000. At the end of the two- to three-year period, associates commonly embark on completing an MBA degree or, if they already have one, are promoted to positions of senior associates, vice presidents, or principals. The vice presidents and principals at a private equity firm supervise associates and assist managing directors and partners in crafting investment strategies and in negotiating deals with target companies. They frequently carry significant responsibilities for handling negotiations. As associates move up to this next level in the private equity firm hierarchy, they are expected to produce ideas for investment opportunities by identifying companies to acquire. Because they are more directly involved in generating investments for the firm, vice presidents and principals usually qualify for a significant percentage of the profits from the fund, or funds, that they are assigned to work on. A primary job responsibility of vice presidents and principals is establishing and maintaining relationships with investment bankers, business consultants, and other financial professionals who can be a source of leads for investment opportunities. Salary compensation at this level usually ranges between $150,000 and $300,000. After a few years working as a vice president or principal, private equity professionals can hope to move up to the coveted positions of managing directors or partners. These are the most senior executives at a private equity firm, the people with the responsibility of making final decisions on what companies a fund invests in and on how the investment deal is structured. They are also the firm’s contact people who provide management direction for portfolio companies. Partners, as the primary individuals who actively solicit investors, are in essence the lifeblood of a private equity firm, while managing directors are the managers of individual funds and responsible for turning investor dollars into high returns on investment (ROI). As is the case with portfolio managers from mutual fund managers to hedge fund managers, the managing directors of private equity funds receive a hefty percentage of fund profits in addition to salaried compensation. How much? Annual carried interest profit sharing for managing directors and partners of major private equity firms can run upward of $3 million. In addition to the financial professionals who occupy the main positions within a private equity firm, there are a number of other professionals who serve special, niche needs for the firm. Lawyers with expertise in investing and corporate purchase deals are important additions whose services help ensure that deals are properly structured from a legal standpoint. Accountants provide important financial analysis of potential target and portfolio companies. Private equity firms may hire a business consultant with industry-specific expertise if they are investing in a company whose business they are relatively unfamiliar with. There are a number of key skills that the most successful players in the private equity business have in common. The first of these is solid business analytical skills. Fund managers who choose private equity investments have to be highly skilled, both technically and intuitively, in being able to evaluate companies as potential investments. In addition, they have to stay on top of the market and overall economic trends. LBO modelingLBO ModelAn LBO model is built in excel to evaluate a leveraged buyout (LBO) transaction, which is the acquisition of a company that is funded using a significant amount of debt. The aim of the LBO model is to enable investors to properly assess the transaction earn the highest possible internal rate of return (IRR). People skills, such as management skills, communication skills, negotiating skills, and networking skills, are also critically important. Private equity investing is very much a team effort within the firm, and also depends heavily on successfully interacting with other financial professionals outside the firm and with the personnel at the firm’s portfolio companies. A career in private equity can be highly rewarding, both financially and personally. Private equity managers often take a great deal of satisfaction from successfully guiding their portfolio companies to new high levels of profitability. You can help yourself hit the ground running in the private equity business by arriving as an applicant at a firm with an MBA degree and several years of experience in the banking industry already under your belt.